I would like to thank Kathleen’s Blog Spot for allowing me to participate in her event!! Hi, It's Kathleen again from Kathleen's Blog Spot. I wanted to share another review and giveaway with you! I am far from a bag popcorn lover. I hate microwave popcorn all together but when it comes to Dale and Thomas Popcorn, I am in love. Dale and Thomas Popcorn is unlike any other popcorn! It is so amazing that I admit I am addicted. My favorite right now is the Peanut Butter and White Chocolate Drizzle. I am constantly changing my favorite because Dale and Thomas has so many amazing varieties! Plus Dale and Thomas ALWAYS has something exciting for every holiday! Their gift baskets are perfect for any occasion. 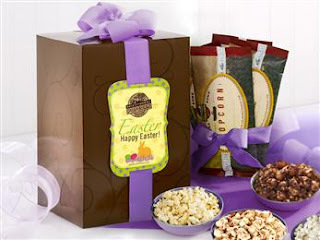 Right now they have a full line of Easter items to help you celebrate Easter with your family and friends near and far. Have you checked out Dale and Thomas' Facebook page? You can find the latest promotions, newest flavors and just say hi! Easter four pack sampler includes four of our most popular flavors beautifully wrapped up with a bow and a "Happy Easter" message. A delicious way to send your Easter greetings! This delightful 4 pack sampler includes the following footlong bags of gourmet popcorn: Chocolate Chunk N'Caramel, Hall of Fame Kettle Corn, Peanut Butter & White Chocolate DrizzleCorn, and White Cheddar & Black Peppercorn.